Scenes of a bridge and river near the 17th parallel in Vietnam. 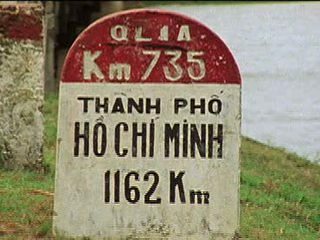 Chicago: “Vietnam: A Television History; Ben Hai River Scenes,” 02/26/1981, WGBH Media Library & Archives, accessed April 19, 2019, http://openvault.wgbh.org/catalog/V_EE716CD5075C4AAEA8FA7484130CC3FC. MLA: “Vietnam: A Television History; Ben Hai River Scenes.” 02/26/1981. WGBH Media Library & Archives. Web. April 19, 2019. <http://openvault.wgbh.org/catalog/V_EE716CD5075C4AAEA8FA7484130CC3FC>.